Let me dive a bit deeper into last week’s post about working with Final Cut Pro X. Although fun, powerful and intuitive, FCP X can also be quite frustrating. Unlike any other NLE software, FCP X needs to be approached with a working strategy. That’s partially because certain terms and concepts have changed, but also because elements within the application do not operate with the same properties. An Event functions differently than a Project and a clip on the Primary Storyline can do different things than the same clip edited to the timeline as a Connected Clip. Apple has not offered any “best practices” white papers or tutorials for things like the optimum use of Events, Compound Clips – when to use them and when not. (Click here for resources that are available from Apple and other companies.) There’s a lot of anecdotal data on the web, but much of it conflicts. Plenty of folks tell you how the app works, but most don’t know what they are talking about – often projecting onto the software what they want it to become, rather than what it is today. One such issue is how many Events should you place your source material into? Events have been presented as analogous to Bins or even Project files in FCP 7. This leads you to think that more Events might be better. For example, if you shot an indie film over thirty days, should you create a new Event for each shoot day? Or should it go into one big Event? Since there is little or no database functionality across Events – and definitely none if the Event is hidden – then one big Event would be the better approach. However, the larger the Event – or the more open Events you have – the more sluggish the application becomes. There’s obviously a sweet spot, but I don’t know what it is. So this becomes a delicate dance. My largest Events to date have contained about 1,000 clips and that seems to be workable. For features films, I’ve also seen suggestions to place all the footage for a single “reel” into an Event and then work one reel at a time. Hide the others not being used via Event Manager X. I’m not sure how well that works when you start to revise and recut the film, but it’s an idea in any case. Compound Clips are the equivalent of nested sequences in FCP 7. I’ve come to view these as “evil” in the same way as the way I have avoided nesting in FCP “legacy”. Use Compound Clips sparingly. For example, if you edit a long timeline of selects, compound it and use that Compound as a source for shorter edits, the database is still tracking all of the longest elements within that Compound. I have found this to be the case, even if you break apart the Compound Clip within the new timeline. I discovered this when I went to consolidate an edited sequence into a new Event. Even though the clips had been broken apart, those clips copied into the new Event included the source Compounds, as well as all the source clips used in those Compounds. The result was the need to copy a lot more into the new Event than was actually used in the final timeline. The solution (though I haven’t fully tested this) has been to first delete the Compound Clips, before I consolidate the sequence into a new Event. So for now, I only use Compound Clips for basic visual effects composites. At the top, I spoke about developing an editing strategy. One of the choices you are presented with is whether to: a) edit directly to the Primary Storyline or, b) to edit your clips as Connected Clips attached to a blank slug filling the Primary Storyline. Neither is right nor wrong. Primary Clips let you take advantage of the magnetic timeline function, but Connected Clips can be freely re-arranged without concern for parent-child clip dependencies. The issue becomes more critical when you have to make changes. For example, your client changes the VO or music, which you’ve edited as Connected Clips attached to your main video on the Primary Storyline. The rub is that the timing of these different elements is interrelated, so you can’t simply replace the VO or music. At that point magnetism works against you. Here’s where FCP X offers two helpful commands – Lift from Storyline and Overwrite to Storyline. The Lift command moves Primary clips out of the Primary Storyline and turns than into Connected Clips. Overwrite does the opposite and places Connected Clips back to the Primary Storyline using an Overwrite edit. It’s best if this is used early in the process, since certain effects, like transitions, are removed or broken. It’s a fast way to pop clips out of the Storyline, quickly re-arranged the order without affecting other Connected Clips and then drop the new order back into place. 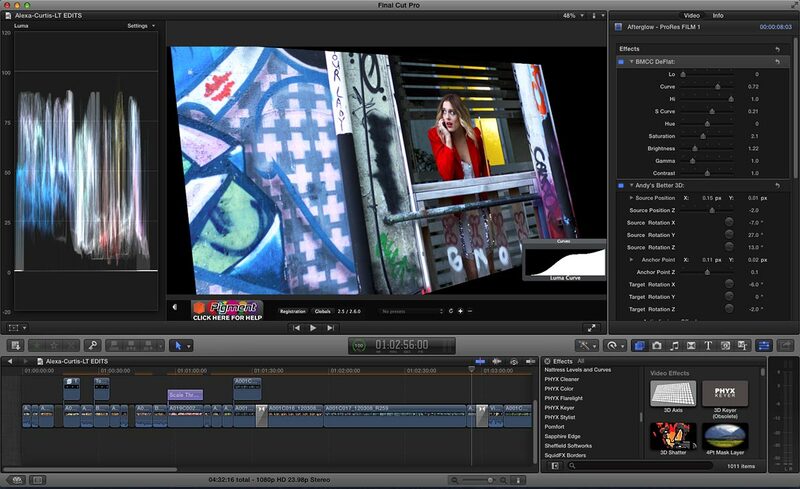 Final Cut Pro X enables you to build very complex Projects (edited sequences). These may work well within X, but are difficult to properly translate if you need to move to other applications, like Resolve, Smoke, After Effects, Final Cut Pro 7, Premiere Pro and others. Most of these don’t understand Compound Clips or applied effects, however Resolve and Smoke do have good FCP XML conversions from FCP X. Round-tripping with Resolve is quite good. If you need to maintain interoperability with a wide range of other applications, I still feel that it is best to first “flatten” or reduce the clip complexity of your timeline. This means to move as much down onto the Primary Storyline as possible. Although grading tools, like Resolve, will work with multilayered timeline, they really work best when video is presented as a single track. Anything you can do ahead of time to streamline the sequence and ease the translation will benefit your project down the line. There are plenty of cool effects available for Final Cut Pro X, but there is no dedicated effects architecture built into FCP X. All effects are built for the FxPlug API that is part of Motion. Even if you didn’t purchase Motion 5, that “engine” is contained within FCP X. All third-party effects are built in (or based on) Motion and published as an FCP X effect, which is actually a Motion template. By design, effects parameters are intended to be streamlined within FCP X. The more complexity a developer adds to a given filter, the more performance suffers inside FCP X. This translates into poor real-time playback with an unrendered effect, as well as a sluggish response when you try to adjust the parameter sliders. I’ve found that the built-in filters and the simpler third-party effects, designed as straightforward Motion templates, run reasonably well inside X. Usually these are effects that only do one function, like a glow or a vignette – as opposed to a filter that combines color correction, glow and vignette into a single plug-in. The ones that are more elaborate offer a greater challenge to zippy performance. My general advice is to limit the effects you do within X to the built-in effects or simpler third-party effects for transitions and image styles/looks. Avoid the more complex effects or any extensive compositing, unless you are ready to render a lot. Typically, I’d suggest using X to cut, but then bounce over to Motion or After Effects for advanced effects. The plug-ins operate far better there and you have a lot more options to play with. This entry was posted in editing, Final Cut Pro X and tagged FCP-X.